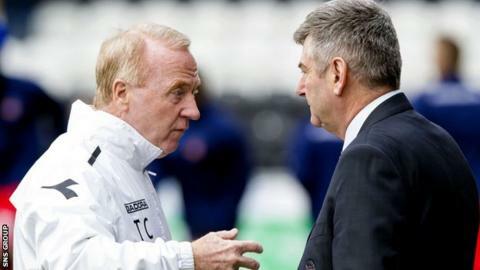 Chairman Stewart Gilmour insists new manager Tommy Craig is "not the cheap option" for St Mirren. The 63-year-old steps up from his assistant's role to replace Danny Lennon who did not have his contract renewed by the Paisley club. "Finances played no part in the decision-making process," Gilmour told BBC Radio Scotland. "We looked at all the people that had been put in front of us and we felt we had a man there who could do the job." Lennon's departure was confirmed on Monday, with his near four-year tenure bringing League Cup success in 2013 and top flight placings of 11th, eighth, 11th and eighth, respectively. Craig, capped once for Scotland, has been at Hibs (twice), Celtic and Aberdeen in an assistant coach's capacity, while his managerial experience is limited to a five-year period in charge of Scotland U21s and a brief spell at Belgian club Charleroi. Senior players Gary Teale and Jim Goodwin will make up his backroom team at St Mirren, with the trio all agreeing two-year contracts. "The board at St Mirren are only interested in what's right for Mirren at all times," added Gilmour, who said Craig was chosen "relatively quickly". "Tommy's experience is vast," he continued. "We had a long chat and he he gave us his ideas on how he could take the club forward. "We're not trying to reinvent the wheel. We just want a little tinkering change, to keep us moving on. "The targets are not dissimilar (to those set for Lennon). Obviously we'd like to get in top six but it's a big ask for a club like St Mirren. "We just have to develop this club as far as we can. "We've got to have a really good youth system, which we have. We need to develop those players into the first team, which we are trying to do. We then have to sell one or two on. "We've got to make sure the books balance. "There is a big picture here. I want to be in the position where we can sit down with a talented young player's parents and convince them that St Mirren is the place for him to be."